The latest theory says that a naturally occurring 30-year cycle in the Atlantic Ocean is behind the slowdown. The researchers says this slow-moving current could continue to divert heat into the deep seas for another decade. However, they caution that global temperatures are likely to increase rapidly when the cycle flips to a warmer phase. According to the Intergovernmental Panel on Climate Change (IPCC), global average temperatures have increased by around 0.05C per decade in the period between 1998 and 2012. This compares with a decadal average of 0.12 between 1951 and 2012. More than a dozen theories have been put forward on the cause of this pause in temperature growth that occurred while emissions of carbon dioxide were at record highs. These ideas include the impact of pollution such as soot particles that have reflected back some of the Sun's heat into space. Increased volcanic activity since 2000 has also been blamed, as have variations in solar activity. 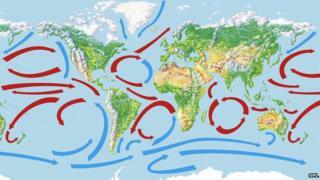 The most recent perspectives have looked to the oceans as the locations of the missing heat. Last year a study suggested that a periodic upwelling of cooler waters in the Pacific was limiting the rise. However this latest work, published in the journal Science, shifts the focus from the Pacific to the Atlantic and Southern oceans. The team, lead by Prof Ka-Kit Tung from the University of Washington, US, says there is now evidence that a 30-year current alternately warms and cools the world by sinking large amounts of heat beneath these deep waters. They've used observations from a network of devices called Argo floats that sample the oceans down to 2,000 metres. But since the year 2000, the heat has been going deeper, and the world's overall temperatures haven't risen beyond the record set in 1998. "The floats have been very revealing to us," said Prof Tung. "I think the consensus at this point is that below 700 metres in the Atlantic and Southern oceans [they are] storing heat and not the Pacific." A key element in this new understanding is the saltiness of the water. The waters in the Atlantic current coming up from the tropics are saltier because of evaporation. This sinks more quickly and takes the heat down with it. Eventually though, the salty water melts enough ice in Arctic waters to lower the saline level, slowing down the current and keeping the heat near the surface. "Before 2006 the saltiness was increasing, this indicated that the current was speeding up," said Prof Tung. "After 2006, this saltiness is diminishing but it's still above the long-term average. Now it is slowly slowing down. "Once it gets below the long-term average, then it is the next period of rapid warming." As well as the data from the Argo floats, Prof Tung has also examined the Central England Temperature record, that dates back over 350 years. He believes that this confirms the regular 70-year cycles of warm and cold spells. This historic pattern, he says, could extend the current period of pause. "We probably may have another 10 years, maybe shorter as global warming itself is melting more ice and ice could flood the North Atlantic, but historically we are in the middle of the cycle." Several other researchers in this field acknowledge the Tung analysis is part of a growing body of evidence that suggests the Atlantic has a role in the pause. Prof Reto Knutti from the ETH Zurich has recently published a review of all the current theories on the hiatus. "I see the studies as complementary, and they both highlight that natural variability in ocean and atmosphere is important in modifying long term anthropogenic trends," he said. "A better understanding of those modes of variability is critical to understand past changes (including differences between models and observations during the hiatus period) as well as predicting the future, in particular in the near term and regionally, where variability dominates the forced changes from greenhouses gases." Other scientists say that the Atlantic hypothesis is interesting but a much longer range of observations is needed. "We really don't have a lot of data," said Dr Jonathan Robson from the University of Reading, UK. "So if there is this 60-year oscillation in the ocean, we haven't observed it all, basically we've observed the impact of it. We may have to wait 15-20 years to know what's going on." Prof Tung believes that whatever the cause and the length of the pause, we are on a "rising staircase" when it comes to global temperatures that will become apparent when the Atlantic current switches again. "At the end we will be on the rising part of the staircase, and the rate of warming there will be very fast, just as fast as the last three decades of the 20th Century, plus we are starting off at a higher plateau. The temperatures and the effects will be more severe."